Ronny Deila has worn his heart on his sleeve as Celtic manager. Most of the time, what you see is exactly what you get from the candid Norwegian. But as he faced the media for the first time since it was announced he will leave the Scottish champions at the end of the season, Deila was able to unburden himself of a painful truth he has been keeping to himself for some time. A man who consistently expressed an absolute sense of self-certainty over his prospects of success and progress in the job, Deila has been forced to accept he failed to meet both his own expectations and those of the club and its supporters. 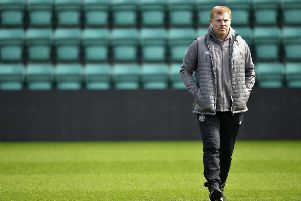 The 40-year-old admits that the doubts set in midway through this largely underwhelming season, prompting him to reach a decision he insists would not have been altered even if Celtic had not lost to Rangers in last Sunday’s Scottish Cup semi-final. “It has been a tough six months,” reflected Deila. “You have asked me many times about improvements and I haven’t answered those questions really well over the last month. “That’s why, in the end, it kills me that I don’t think the team has improved in the last six months. “That’s my responsibility. One of the reasons we haven’t improved so much is that we have lost important games and the pressure on me has been more and more. That also affects the players and the whole surroundings. “That’s why I was thinking this is the best thing for me and the club, to come out now and give everyone an answer. I feel I haven’t got the results and improvement I wanted. “I don’t think it would have been a different decision if we had beaten Rangers, because I wasn’t happy with the performance. It wasn’t only that performance. It has been overall for a while now. There hasn’t been that energy I need from my teams. So that has nothing to do with the Rangers game. “Of course, it was a hard blow but it was not the final thing. It is about development. That is one of my biggest things. I don’t do things just to win. Of course, I want to win – but I have to win while seeing things are progressing and by playing attractive football. “I have tried for a long time but you can’t keep on going. You have to think about the club as well. “I have tried for some months now. Hopefully the club will be going into a Champions League qualifying campaign again this summer and with the two defeats in the two previous years, there would be even more pressure on me and everyone else. Deila, as yet, is unable to identify why his efforts did not have the desired effect but offered no complaints about the response to his methods from the players under his command. “I can’t say anything about their attitude,” he added. “It is very easy for a coach to say the players haven’t performed as they want. “But there is a reason why they haven’t done it and the coach is an unbelievably important factor in that. “I know I’m a great coach, I know I’m going to be a great coach in the future, because I don’t blame my players. “I haven’t made some of them as good as they could be. Some of them have been very good but overall it hasn’t been what we need at Celtic. While insisting the decision to move on is his own, Deila accepts that his future would have been uncertain in the eyes of the Celtic board regardless of whether he wished to continue in the job or not. “There would have been a hard evaluation about everything, about how to do things to improve the team,” said Deila. “The board would have had to make a decision. “But it has been my call. Of course, I talk all the time with [chief executive] Peter Lawwell and I have really appreciated that when things have gone well or badly, the communication has been good. So what now for Deila? Regardless of what happens over the final five games of this season, when he hopes to bow out with a final “Ronny roar” to celebrate retaining the Premiership crown, he will move on as a coach who has won league titles in two different countries. “I don’t know,” he said. “Hopefully I’ll get a little bit of sun first, then I will use time to reflect upon things but in football you never know what will happen.